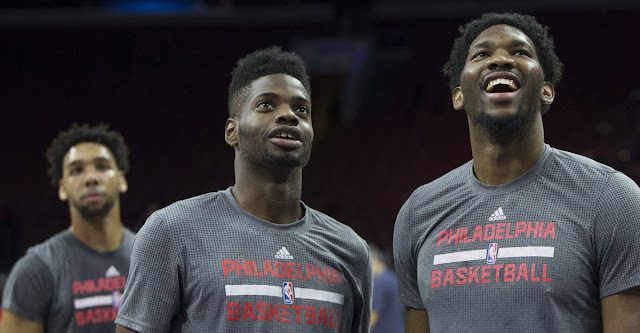 Joel Embiid Reveals Nerlens Noel as Best Friend: Will 76ers Trade Jahlil Okafor? We all know the Philadelphia 76ers have a major logjam in their frontcourt, which features first-round lottery picks Nerlens Noel, Joel Embiid and Jahlil Okafor. Embiid has thrived in Philly so far this season, and it's clear that the Sixers are going to keep him. It is likely they will trade either Noel or Okafor instead. Noel has been involved most in the trade rumors, but these recent reports suggest it will be very hard for Philly to get rid of him. I think this endorsement from Embiid may increase the chances of Noel staying. From the get-go, it may have been Okafor as the odd man out all along. In last year's NBA Draft, reports came out that the Sixers were set on drafting D'Angelo Russell with the third overall pick. However, the Los Angeles Lakers shocked everyone in drafting the Ohio State guard, as many thought they would select Okafor. Philly had no choice than to select the next best talent available, which ended up being Okafor. It might end up being easier for the Sixers to ship off Okafor for the right price than trying to deal Noel. I guess we will have to see as the season goes on, but it's clear that Philly needs to get rid of one of the two by the trade deadline.